Outwell Edmonds 5A Tent offers more than 21 m² (226 ft²) in its 4 rooms, so this is a luxurious option with inflatable beams instead of poles, with tinted PVC windows and 3 entry doors. 3 entry doors, all with mesh. The letter A which you see in the name indicates that this is an inflatable tent with air beams instead of classic poles. So this is the same as in its bigger cousin the Outwell Clarkston 6A tent. The structure is tunnel-shaped with 4 pre-bent beams and it is not freestanding as typical for such a type. 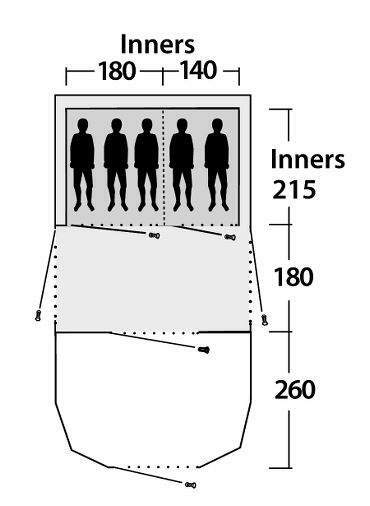 The space is organized in i) what they call a wet room, ii) a dry room, and iii) inners, which means sleeping zones with two separate units. So this is a 4-room structure but with the difference in the protection in various units, see the picture below. The floor plan with inners, the dry room, and the wet room. They use the term Universal Inner Tent for the inners, see the picture below. This is because you can use it as a large single room, or split to create two rooms, but you can also remove the half of it for extra living space which would then have an L-shape. The inners are with their own floor. So here you have a full protection. The inners – the tent within the tent with two sleeping units. The so-called dry room is a living room with its fully sewn-in and sealed floor which extends under the inner tent as well so you have a double floor in the sleeping zone. The living room is thus also a fully protected area. The front room (the wet room) is the shell with the same waterproof rating as the rest of the tent, but the floor is removable and it is linked in by toggles and not sewn-in; I guess this is why they call it the wet room. Here you can dry your towels and you can push the floor to the side to avoid the water dripping on the floor. In this area, you are completely protected from the rain and flying insects, but crawling insects can in principle get in. It would be appropriate to call this area partially protected. But here too you have several PVC windows just like in the living room. Note also that this is a very tall structure with the peak height of 220 cm, so I have added it in my list of very tall tents, have a look there. It is also in my list of extra large tents, you will realize below why. Space-wise, they do not provide the exact numbers for the total protected area, so my estimate is that it offers more than 21 m² (226 ft²) in all 4 rooms. This means 4.2 m² (45.2 ft²) per person if used by 5 people as the suggested capacity tells you, so this is a truly luxurious design. Note that the living room alone has 6.3 m² (68 ft²), and it is fully sealed; obviously several more people can sleep there as well. All in all, the actual capacity of this tent is far bigger. It can easily accommodate 8 – 9 people. Climate-wise, you realize that this is a fully enclosed space without mesh, with PVC windows. Such a structure keeps the warmth, so the tent is very suitable for a cooler environment and with lots of rain. It will serve you well also in a desert-like cold environment with lots of dust in the air. In the case of a warmer area, it will work well if you are able to keep it with mesh on all doors only; so it should perform well in a warm and dry area. Seasons-wise, the declared waterproofness of this tent is huge (more below), so it can withstand a lot of rain. The structure is totally flexible and with numerous guylines, and it is a very aerodynamic design with hidden poles. They describe it as Aerodynamic Storm Protection 9; this means 9 on the Beaufort scale. If you are not familiar, this means 75 – 88 km/h (47–54 mph). Note that this is above their Nevada 5 tent which has the level 8, but below their Vermont XLP Tent with the rating 10. So this tent can take a lot, but bear in mind this is an air-beam tent, and this cannot have any snow on it, so do not even think of using it where you might have a snow-storm. Weight-wise, this is a heavy item, no less than 56.4 lb (25.6 kg), and it is also very bulky when packed, 35 x 18.9 inches (89 x 48 cm) so you need a car for it. You know already, those are 4 air beams with the maximum pressure of 7 psi (0.5 bar). This is what they call the Outwell Rigid Air System with an easy inflation and deflation, and the pump is included. The shell is what they call Outtex 4000, essentially a 100% polyester taffeta with all taped seams. The waterproofness rating is 4000 mm, and this is very typical for this brand but this is far more than many other tents on the market. The shell is with a thermo-reflective coating, which is their own unique design. They also have what they call the Night Sky Ceiling which reduces light penetration in the bedroom, so this is a sort of the dark rest design. The floor is a double-coated bathtub style 100% polyethylene with 10000 mm hydrostatic head, so here you have a totally waterproof layer. The inner tent is a breathable polyester. 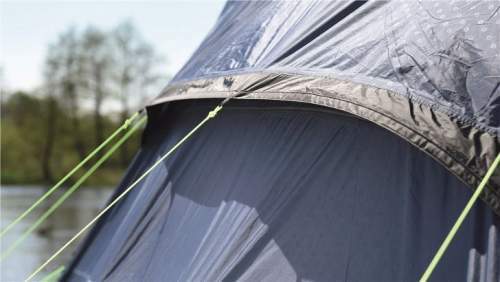 All materials are fire retardant and they meet the latest regulations for tent materials. You have 3 external doors plus 3 inner doors. All are with mesh. The entry doors are double-layer structures with PVC panels and mesh so you can use them depending on the weather. The inner doors are with mesh in the upper sections, for ventilation. There are many PVC windows, 4 separate plus those on the doors, and they are equipped with inner toggled panels for privacy. Note that the PVC is tinted for a reduced glare. The structure which you have here is very dependent on vents, so you have them above the windows in the living room, and also on the back side behind the sleeping zone, see the picture below. 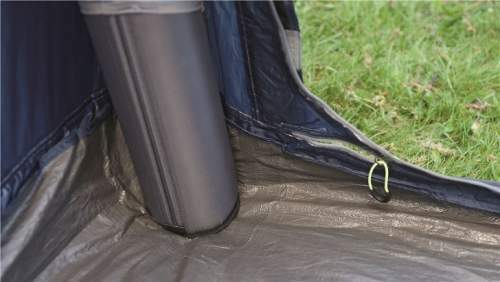 This large rear vent is paired with a mesh section on the back of the inner tent. When the sky is clear you can keep all 3 huge external doors with mesh only and this will provide an optimal cross flow. Huge rear vents with Velcro stiffeners and zippers. Three types of color-coded pegs for an easy setup. 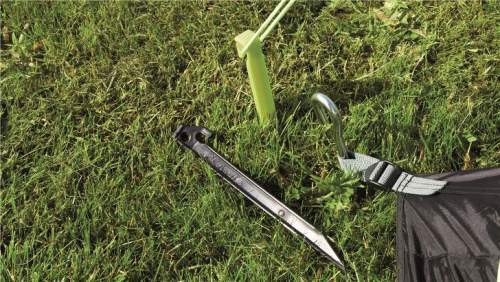 Three types of pegs for an easy pitch, all are shown above. There are multiple entry points for the electric cable, on the external wall and the inners, see the pictures below. Many storage pouches (10 in total) are on the wall between the two inner doors. 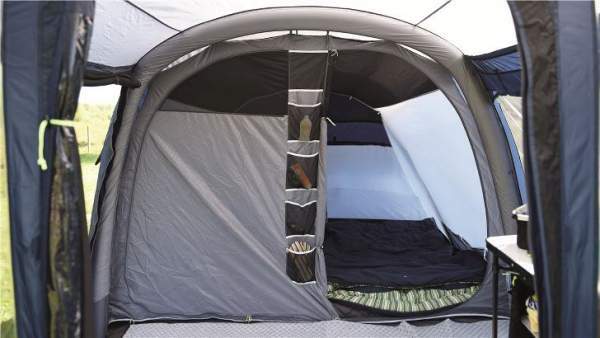 You have a flat-down groundsheet at the D-style front door for an easy access with a wheelchair. OGR system is in place which implies Velcro bands for guylines to avoid tangling when packing away. Dry Zip system which includes panels that run all over the length of the whole zip to protect against rain. The carry bag is with straps to carry it short distances (but see the weight). The external cable entry with a zipper. The cable entry on the inners. Weight: 56.4 lb (25.6 kg). Dimensions: 266 x 138 in (675 x 350 cm). Area: 226 ft² (21 m²). Area per person: 45.2 ft² (4.2 m²). Packed size (L x D): 35 x 18.9 in (89 x 48 cm). Peak height: 86.6 in (220 cm). In the table below, I give this Edmonds 5A tent side by side with two other inflatable tents by Vango, all with the same declared capacity. It is much heavier but it also offers far more space per person. However, it is more expensive than the other two; the prices at the moment of writing this text are around $860, 447, and 589, respectively. Please follow the links to check for the updates. In the summary of this Outwell Edmonds 5A Tent review, you have seen all its features and you realize how much space per person this tent offers. The waterproofness is great, air-beam technology is a relatively new and modern trend for an easy setup, but it all comes at a price. If you find it too pricey for you, I gave some alternatives in the comparison table above. If you want more from this inflatable technology, please check in the category Inflatable Tents here in the site. But if you would rather have a classic tent with steel poles, check this Outwell Flagstaff 5 Person Deluxe Tent from the same brand, an incredibly reliable tent. Check also this Outwell Cloud 5 Encounter Tent from the same brand, which is a smaller extended-dome type tent. 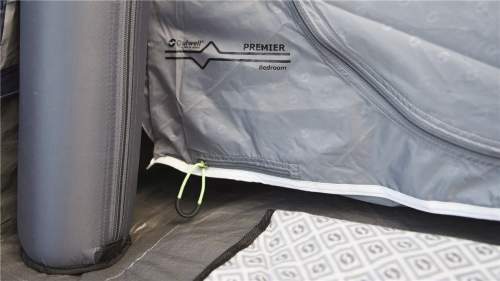 I wonder if you have any experience with this tent or the brand, if so please let us know, there is a comment box below. Thank you for reading and I wish you a nice day.